Just as Albion’s seniors will throw their caps up in May, some of our hard-working horses at the Held Equestrian Center will also be graduating from their job as a school horse. Everyone who rides at Albion College knows any school horse by the flick of a tail, and people appreciate their work. Not only do the horses here learn from each student and coach, more importantly, each student and coach learns from the horses. Wherever the horses have been, their journey brought them to Albion College, and will now be on the latest part of their journey as they find a home outside of the Held Equestrian Center. The two horses retiring this 2017-18 school year are James and Kingston. Both horses are dominantly in the hunt seat discipline but are able to dabble in dressage and eventing. These are their stories. 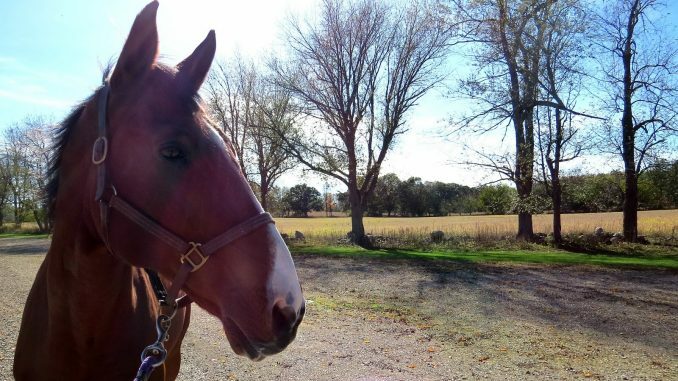 James is a 25-year-old Irish sport horse, donated by Kiersten Sneed (‘09), who rode at Albion’s Equestrian Center. Sneed and James often competed in eventing shows together, which are competitions consisting of dressage, speed/endurance and show jumping. They also participated in Pony Club, an organization that teaches young children about horses and riding, together. James (and his rider) in his pre-Albion days. Courtesy of XpresFoto. Before Sneed studied abroad in France, she tried to sell James since she couldn’t take care of him while she was away. She couldn’t find anyone that would buy him, so she donated James to the Equestrian Center. Since 2009, James has helped teach an innumerable amount of lessons, from beginner level to advanced level. He’s also participated in many Intercollegiate Horse Show Association (IHSA) shows, clinics and miscellaneous eventing shows at Albion. He’s also traveled with the Albion College Hunt Seat Team to other shows outside of Albion. Eight years later, James is slowing down after all of his years of teaching students. Yet, as a healthy, older horse, he still keeps moving and will do what is asked of him. Carolyn Killewald (‘04), the office manager at the center, is currently looking for a new home for James, where he can do some light riding work or trail rides to keep his joints moving. So until the stars align for the perfect opportunity for James’s new home, he will remain at Albion, munching on hay out of his favorite garbage can. “He’s worth his weight in gold,” said Killewald. Kingston (pictured at the top) is a 21-year-old, 18-hh (hands) tall horse with a big heart to match. Kingston was donated to Albion by a dressage rider, and Kingston arrived at Albion with quite the impressive history. Originally, he was a Grand Prix jumper horse in Europe and tried out for the World Cup. He did not make it into the Cup, but an amateur dressage rider saw potential in him and shipped him overseas to America. The rider and her dedicated coach trained Kingston up to the International Federation of Equestrian Sports (FEI) levels of dressage. FEI level dressage horses are the highest trained level possible in the dressage discipline. For Kingston, it’s quite amazing that he was at the highest levels of both jumping and dressage, and was successful in both. “He’s been everywhere, he’s done everything, he knows all the tricks of not only one discipline, but two,” said Killewald. After his romp through the many high-level dressage shows of America, he was donated to Albion College. Kingston has been teaching dressage and hunter classes and participating in IHSA shows with the Albion College Hunt Seat team. He’s a favorite among all the students that ride here and also among the coaches that teach alongside him. Recently, Kingston has had some soundness issues due to being diagnosed with pedal osteitis, a foot disorder that makes movement uncomfortable at times. He has special needs that need to be tended to in order to keep him comfortable, but with those needs met, he moves wonderfully. With the diagnosis and his climbing age, Kingston is nearing retirement and, like James, is also looking for a forever home. A home with stable fencing and a big barn to house a grandeur friend such as Kingston would be optimal for his happiness. Until finding his forever home, he’ll remain at Albion with James, where they can lounge in the green pastures and receive pats from their students.